Alan Mathison Turing was educated at Sherborne and studied mathematical logic at King's College, Cambridge, becoming a Fellow in 1934 at the age of 22. Alan Turing was a pioneering mathematician widely considered to be the father of modern computer science. His revolutionary idea was to create a machine that would turn thought processes into numbers. The machine would read a series of ones and zeros from a tape which described the steps needed to solve a problem or task. It took nine years for technology to advance to the point where a machine could be built to test his ideas - and it worked. Today all the digital computers that we use work on this same principle. 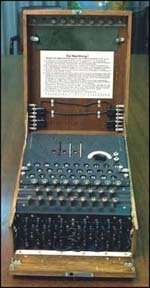 Turing believed that an intelligent machine could be created by following the blueprints of the human brain. His landmark paper of 1950 described the Turing Test for determining an intelligent machine. The test consisted of a person asking questions via a keybord to both another person and an intelligent machine. If the computer's answers could not be distinguished from those of the person after a reasonable amount of time then the machine has some intelligence. He joined the Government Code & Cipher School at Bletchley Park in 1939, where he worked on breaking the German Navy Enigma code. A brilliant mathematician, he was very successful at this, though eccentric. 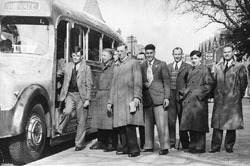 In November 1942 he went to the USA to assist the American code breakers. The Blue Plaque on Ivy House. After 1945 he helped build one of the world's first computers. He was made a Fellow of the Royal Society in 1951. He lived at Ivy House in the High Street, Hampton between 1945 and 1947 while working at the National Physical Laboratory in Teddington. 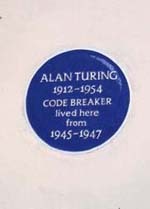 There is a Blue Plaque on Ivy House recording his time there. He died in 1954 after eating an apple coated with cyanide. San Francisco University is building an archive of Turing's life and work.